Norma J. Davis, 87, of Tiffin, died at 5:47 p.m. Sunday, Aug. 12, 2018, at Mercy Health – St. Vincent Hospital, Toledo. Norma was born Jan. 21, 1931, in Fostoria, to Harold and Helen (Hansenfleck) Perrine. She married H. Paul Davis in 1949, and he died in 1992. Survivors include a daughter, Barbara Correll of Tiffin; three grandchildren, Jennifer Jeffrey, Kristie Stambough and Cathy Miller; and eight great-grandchildren. She was preceded in death by her parents; her husband; and a son, Paul Michael “Mike” Davis; a grandchild, Shawn Correll; a brother, Richard Perrine; and a sister, Betty Robinson. 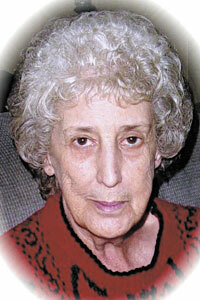 Norma was a graduate of Tiffin Columbian High School and worked as a cook at many restaurants, including General Electric and American Standard, where she retired. There will be no services at this time. Burial will take place at a later date in Seneca Memory Gardens. To offer condolences to the family, go to www.traunerofuneralhome.com.